Is there a way to create a form reservation for time slots? How can you create a dropdown that allows slots to be no longer avaliable if someone has already signed up for that slot? We are doing a meeting where people can sign up for specific time, we have 4 spots per time period. is there a way that allows us to have a sign up that changes options as people sign up on a reservation form. Hi Blake, although there's no way for you to do that with a dropdown menu, you can still achieve something similar by using widgets. Here's a demo form https://form.jotform.com/62496269258975 showing how the Appointment Slots widget works. 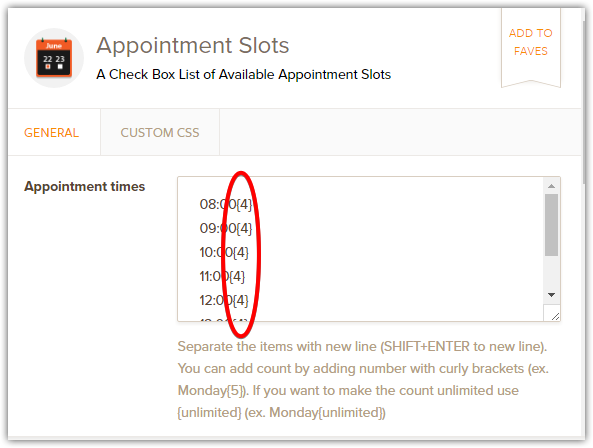 The idea behind this widget is to allow your users to pick a slot (be it a time, a date, or let's say, a product that has limited stocks) and the counter continuously decrements for each submission. Once the counter reaches zero, then no one can pick that time period anymore. Give it a spin and don't hesitate to ask if you bump into an issue while setting it up.